Hillsboro Beach Florida is part of Florida's Millionaire Mile and presents a pristine beach of glistening white sand and aquamarine water. How do you know you are in Hillsboro Florida? Well, look up! If you see a lighthouse looming up toward the Heavens, you are here. 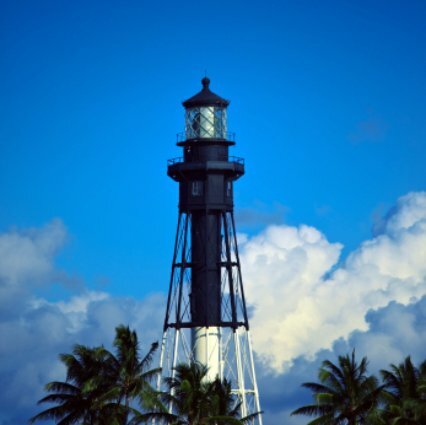 The most notable feature of Hillsboro Beach is this tall and stately lighthouse built in 1907 and elegantly decorates its shore. This lighthouse proudly stands 136 feet above the water and according to the town of Hillsboro, it contains a 5,500,000 candlepower light and is the most powerful light on the east coast of the United States. This beach has a classy, comfortable feel… and yet, it also projects a laid- back feeling within, despite the “exclusive” ambiance found here on ‘Millionaire Mile” as it is called. It lacks a public beach access but if you are able to sneak a peak or find an opportunity to relax on this pristine beach, you won’t be disappointed. The privacy and upscale nature of Hillsboro Beach Florida is more what this beach is known for even more than the beauty of its aquamarine water and soft white sand. Travel over to the tourist friendly city of Pompano and spend some time and money gambling in the Isle Casino & Racing at Pompano Park which also boasts some great buffet meals. Check out the South Florida Railway Museum in nearby Deerfield Beach where you can learn about the history and importance of Florida’s railway system. This railway museum is a great attraction to check out if you’re interested in all things historical so allow for adequate time. Antique collectors will enjoy shopping at the Hillsboro Antique Mall, one of the only unique shopping places in Hillsboro as the rest are mostly geared towards locals. Kids of most ages: Patch Reef Park in nearby Boca Raton features baseball and football fields, basketball courts, a playground and picnic pavilions. Eating: Catch a snack or deli style meal at Pompano Beach’s Bagel Snack. There aren’t really any restaurants in Hillsboro but there are plenty in Pompano and Deerfield. Another great one to try is La Veranda for some excellent Italian dishes. Sleeping: There is one solitary hotel, the Seabonay Beach Resort right on Hillsboro Beach that offers a quiet retreat and access to the “private” beach. If you want more action, there are lots of choices in Pompano ranging from value hotels like the Surfside Resort or a bit more expensive ones like the Royal Flamingo Villas. Copyright 2010-2011 Best-Florida-Beaches.org. All Rights Reserved.